Sometimes even Ciara needs some time to herself. 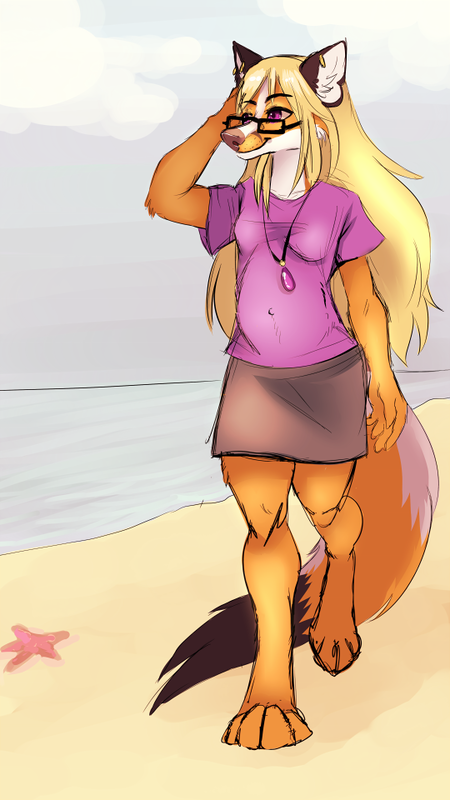 Dressed in her most comfortable clothes, she slipped out of her castle by one of its many back doors and left the problems of ruling her kingdom and all her tiresome courtiers and bodyguards behind to stroll along an peaceful stretch of sand that only she knows about. As she walked, she looked out over the rolling ocean and wondered about the people who must live over the horizon somewhere and about the future of her own land. She had spent so many years working to make Viridis a paradise, but there are still plenty of problems to be solved and she can't help but wonder what sort of world the child she's carrying would inherit. A little idea I've been kicking around for a while now. It's a tad anachronistic since Ciara's daughter has been around for a while now, but I've always wondered what her reaction to having a child must have been. Especially since it was supposed to be impossible. I also thought this would be a good excuse for her to wear something different for a change. I had originally imagined her usual red tunic and trousers as a sort of uniform worn by the soldiers of her kingdom, making it not exactly the most comfortable outfit for a mother-to-be. So I decided to trade it out for this pretty purple top and black skirt because I think it looks really pretty on her. And to further annoy those who insist that because she's a queen she must dress like some Victorian nightmare. Queen Ciara Lohan belongs to me.